Depending upon the treatment regimen and individual patient variability, the patient’s reaction to therapy may vary. As a healthcare provider you understand that early supportive therapy can help limit or prevent acute and chronic complications, for this reason you may consider adding supportive care medications along with proper diet and hydration to manage these side effects. Entrinsic Health Solutions developed enterade® to help manage the unique nutritional needs of patients receiving treatments for cancer. Adding enterade®to your patient’s daily routine can help manage and maintain GI function and provide the nutrients and hydration needed to minimize the side effects of cancer therapy. enterade® improves how patients feel so they can fight back and remain on necessary therapy. Can Help Reduce and Manage GI-related side effects. The villi promote proper absorption of nutrients, electrolytes, and fluids. A crucial area in the villi is located on the tip, where glucose is absorbed. In healthy villi, glucose is used as a transport mechanism to promote proper absorption. However, in patients undergoing the treatment of cancer, the villi may be blunted and their absorptive properties are greatly diminished leading to, reduced nutrient absorption and dehydration. In a damaged GI system, blunted villi are unable to absorb glucose-bound nutrients and electrolytes. 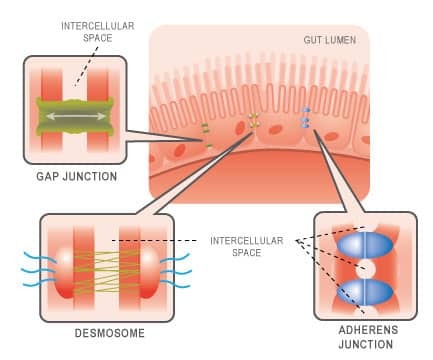 This image (left) depicts a view of a gut barrier junction that has not been irradiated (normal cell junction). The image in the center shows a view of damaged irradiated barrier junction, with a clear space formation between the cells. The image on the right shows the rebuilt gut barrier junction complex, post irradiated, with a tight barrier after taking enterade®. Note that the post irradiated barrier, after taking enterade® is tighter, than the non irradiated cell (normal cell). The enterocytes act as the main physical barrier preventing harmful pathogens, (i.e. toxins and or bacteria) from entering the mucosa20, 21, & 22. When these regions are exposed to a toxic environment (e.g. treatment of cancer) the integrity of the gut barrier function is compromised resulting in antigenic translocation. Bacterial translocation can cause local and systemic inflammation resulting in the following side effects: diarrhea, oral mucositis, dehydration, and general GI symptoms. 1. Yin L, Vijaygopal P, MacGregor GG, et al. Glucose stimulates calcium-activated chloride secretion in small intestinal cells. Am J Physiol Cell Physiol. 2014;306(7):C687-C696. 2. Cheuvront SN, Kene ck RW, Charkoudian N, et al. Preliminary characterization of enterade® rehydration kinetics following intra- and extra-cellular dehydration. Poster presented at: American College of Sports Medicine (ACSM); June 2016; Boston, MA. 3. Multinational Association for Supportive Care in Cancer TM (MASCC)/European Society for Medical Oncology (ESMO) Guideline 2016. Antiemetic Guidelines. 2016 V.1.2. 5. Stein Ather, Advanced Medical Oncology 2010; 2:51-63. 1. Constantine Mantz, MD, 21st Century Oncology, Fort Myers, FL21 Century Oncology. 4. Multinational Association for Supportive Care in Cancer TM (MASCC)/European Society for Medical Oncology (ESMO) Guideline 2016. Antiemetic Guidelines. 2016 V.1.2. 6. Stein Ather, Advanced Medical Oncology 2010; 2:51-63. 10. M.G. Kris, “Why do we need another antiemetic? Just ask,” Journal of Clinical Oncology, vol. 21, no. 22, pp.4077-4080, 2003. View at Publisher. View at Google Scholar. View at Scopus. http://www.cancer.gov/cancertopics/pdq/supportivecare/nausea/healthprofessional. 11. Sun CC, Bodurka DC, Weaver CB, et al. Rankings and symptom assessments of side effects from chemotherapy: insights from experienced patients with ovarian cancer. Support Care Center. 2005; 13:219-227. 12. Grunberg SM, Deuson RR, Mavros P, et al. Incidence of chemotherapy-induced nausea and emesis after modern antiemetics. Cancer. 2004; 100:2261-2268.